Cherry Blossom Friendship Cake ~ I Can Do That! The annual National Cherry Blossom Festival in Washington, D.C is now on since March 26 until April 10. There are several events but the most popular activity is walking along the tidal basin to ooh and aah at the cherry blossoms. I've seen the spectacular blooms just once in 1992 but never went back to avoid the huge crowd that descends on the district the entire 2 weeks. Besides getting pushed and stepped on by tourists and tripping on exposed roots, finding a parking space is nearly impossible unless you drive there at 6 in the morning. Instead of going to Washington, D.C. to join the festivities, I am celebrating at home by watching my favorite Japanese and anime movies (Seven Samurai, Ghost in the Shell, Akira, Gojoe, etc.) and making sushi and onigiri. 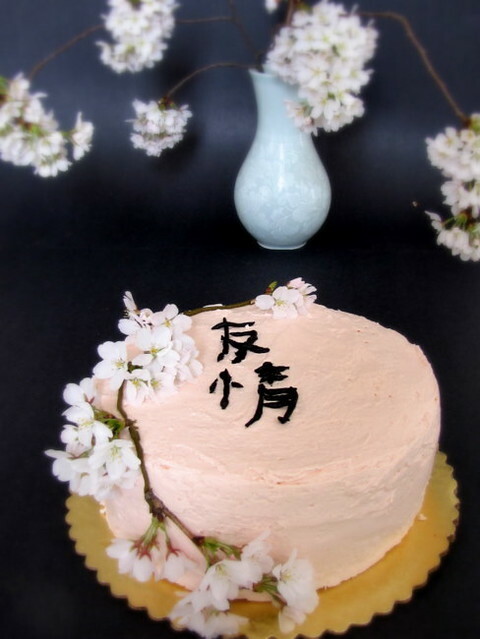 And to thank the Japanese people for this beautiful gift to the U S of A, I baked a cherry flavored sponge layer cake decorated with cherry blossoms from my tree. The buds aren't in full bloom yet as it is still early; they will be on the second week of April. I cut some of the lower branches and forced the buds to open indoors. I wrote "friendship" in Kanji, the design and idea I got from A WORLD OF CAKE although I did not follow the cake recipe in the book. 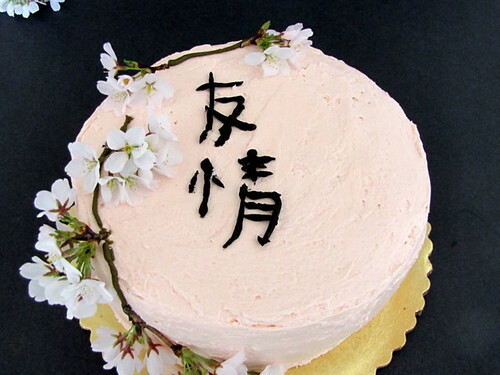 You can use your favorite layer cake recipe and words of your choice written in Kanji. Line two 8-inch round pans with parchment paper. Preheat oven to 350°F. In the bowl of a standing mixer with paddle attachment, beat eggs on medium speed for 2 minutes. Add sugar and beat on high until pale yellow in color and mixture has thickened. Add milk, cherry flavor, and food dye and mix well. Continue beating on low while slowly adding flour. Mix until smooth and creamy. Pour into the prepared pans and bake for 25 to 30 minutes or until cake test is done. Remove from pans and let cool on wire rack. For the frosting, omit vanilla and add a few drops of pink food dye and cherry flavor to the Creamy Vanilla Frosting. Remove parchment paper, fill, and frost the cake. Decorate with fresh edible or candy flowers. It's that time of the year! You decorated this one well...would be nice if the flowers are edible :D I also have mine lined up for some cherry flavors...there's a cherry blossom foto contest going on...will send you a link thru a fb. That cake looks so lovely.